Dumbbell Incline Curl is a single joint movement. The exercise focuses on those sectors of the outer (long) and inner (short) heads of the biceps. Brachial and brahioradialisite assist folding and front shoulder heads appear as extras or synergists workmanship. Although simple, the exercise is not recommended for beginners, for various reasons and circumstances, which are described below. This type of folding allows equally well the implementation of "clean" reps with less intensity and movements "cheating" by lowering the load that heavy dumbbells have on the spine. Mastering (delay) of the momentum in deployment has dynamic stretching on toned biceps, which increases mikrotraumatizing effect and thus provoke growth. The position of elbows to shoulders in turn puts front shoulder heads in a weaker position synergists (supporting muscles) as compared with classic folding dumbbell standing, ie weakening their influence. This is of high importance in the use of false movements, which will be discussed below. In order to prevent traumas to the shoulders, not recommended implementation of the technique on the bench with a slope less than 45 degrees. Suitable for explosive, partial and cheating repetitions, respectively, for strength and mass (myofibrillar). It is important in the negative phase of the movement to leave the elbows slightly shortened to safe your Biceps from traumas. An attempt to control weight in intensity greater than 90% (PM: 5 to 6) abruptly granting of dumbbells is particularly risky for both Biceps and front shoulder heads. The risk increases with increasing angles of elbows, i.e. if you try to let weight and momentum straighten your elbows. 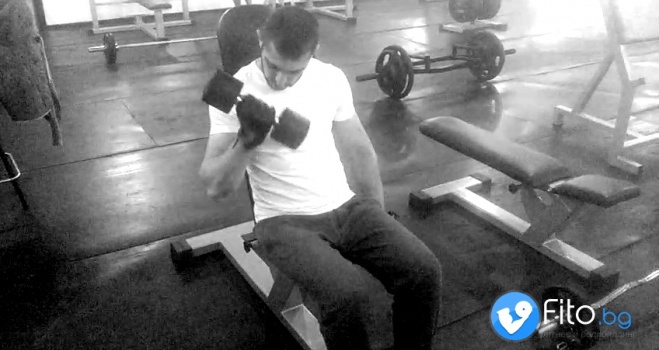 Simply put, if you can`t make more than 8 reps with the current weight do not strech you elbow joint completely when putting the dumbbell to the floor. Suitable for long series in order to gain strength endurance, endurance and maximum engorgement. Better retention in the lower position contributes to increased nervous tension in already toned muscles. It is suitable for stress-generating training. Do not hold your hands in the lower position for more than 3 seconds or 30 seconds in all series. Use faster folding-unfolding retarder, ie when the right hand reaches the uppermost point, left already started upward movement. Not recommended, because of unpleasant twisting of the spine. Better do not try! Elbows do not slip or they may move up to 2-3 centimeters during lifting. Standard technique. Elbows slip to 3-4 centimeters forward during the lift and in the middle of the amplitude start going back in order to dodge the point of rest. It is mainly used for power endurance and mass bilaterally (both sides) folding table, ie this is "cheating" movement. Lifting speed is a key factor for the effectiveness of the technique, but should not be an end in itself for the safety of the shoulder joints and tendons. Elbows are slipped back from the shoulders during the folding, Biceps are supported by the Posterior shoulder heads. Increasing the emphasis on the upper sector of the biceps, with bias towards foreign heads. The smaller the angle of inclination of the bench, the greater the focus is and the greater is the risk of injury when using false movements. In the upper position hold for a split second and controlled lower to the starting position. Drop the dumbbells on the floor or lean your body down bending the spine forward (as in abdominal press) to make up the slope and straighten. Place the dumbbells on the bench. Dumbbell Incline Curl is not suitable for beginners. To them it would not bring much more benefits than Basic dumbbell curl. Its not recommended to use this mouvement as a first exercise in you Biceps workout. About workmanship there are too many risky moments, underestimation of which threatens with growths and twists. For medium and advanced Dumbbell Incline Curl can bring more benefits to low and in well-toned muscles. Therefore you can use it as third or fourth exercise in your Biceps workout. For best results periodically include this exercise in your program to unlock new growth. April/10/2015 четиво за 3 мин. July/1/2015 четиво за 1 мин. April/14/2015 четиво за 7 мин.